Making truly independent film and music is a struggle. We don’t do it for glory because there is no glory. We don’t do it for money because there is no money. We do it because, at our core, we have to. And we do it with the hope that what we create will add value to the lives of those who hold our success or failure in their hands: You, the audience. “Independent” film and music does depend on one thing. It depends on the audience. It depends on you, the culturally curious, to help spread the word. 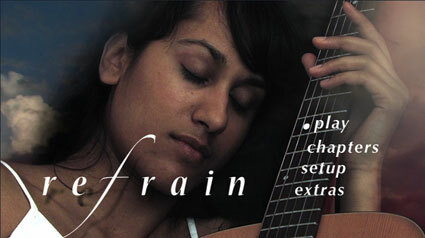 Refrain is now available on DVD and VOD (Video on Demand). Support the struggle by seeing our movie, hearing our music and passing it along. And of course, let me know what you think! Feedback is also very important. DVD shipping costs vary from distributor to distributor depending on your location so I suggest you shop around for the best option from the choices above. Here’s what you get with your order: NTSC, All Regions DVD, Colour, 2.0 Audio, English Subtitles. Extras include: Commentary track from Writer/Director Tyler Gibb & Actress/Composer Vidya Lutchman, deleted footage, cast interviews and more. Don’t forget also that all the music from the movie as well as the music from our Side Project is available for free to download at our website. Below is a new trailer I put together just for the DVD release. I truly hope you will be touched by Refrain. I’ve been in promo mode this week to get the word out about Refrain’s DVD/VOD release now slated for Tuesday, March 9th. I could - and eventually probably will - do an enormous post just about trying to promote a film on your own. It’s not a lot of fun but it’s got to get done. So yup. That’s the date. Just around the corner really. And what you’ll be getting with your purchase is an all regions, NTSC disk (in the case of the DVD) with a full colour, full wrap jewel case. The disk’s got a few extras including a deleted scene, cast interviews and a commentary track from both lead actress/composer Vidya Lutchman and myself. Did I forget anything? English subtitles as well. Did I mention my fatigue? So that’s it. March 9th. The icing on the cake. I’ll post details here including what vendor to use to get the best price on shipping (in the case of DVDs). Nearly two years from when I first announced pre-production on Refrain (it went by another name back then) an international DVD and VOD release is finally just around the corner! We’re going to have a little launch party here in Montreal on March 6th and the film will be available ’round about that date - I haven’t completely ironed out the details yet. Rest assured, the announcement will be made right here when it happens. But yeah. Two years from start to finale. I’ve cut my time in half since Minushi. By this standard the next film should only take a year… Eesh, I better get back to work. “No entry for heavy vehicles. Residential site only,” in English. “I am currently out of the office. Please send any text that needs translating,” in Welsh. This was all less funny to me than the Welsh sign. I’ve read this text a gazillion times over the past few months and simply never noticed the typo. I would surely have spotted it however, if not for the handiest of handy computer features, the ol’ copy/paste. Mark my words: Memories of Y2K have faded quickly my friends but one day… One day copy/paste will doom us all. So yeah. Refrain DVD in revamp mode. New trailer coming in the new year. Get your lips revving, we’re going to need some of that good old fashioned word of mouth in the next few months. In the wake of Refrain’s premiere at the Festival des Films du Monde I’ve been busy putting together a DVD of the movie. I will also be making the movie available by video on demand (VOD). Not sure when it will be officially launched yet but I just wanted to let those of you who email me wondering about it know that you will get a chance to see the film eventually.